Wattle and daub homes have been around for millennia. ince writing my last column about industrial farming I’ve spent a good deal of time ruminating over what to do with all that poo. It is quite clear that mega-farms are here to stay. It is only a matter of time before they are fully established in the UK and continental Europe. Here in Le Marche, where spring has sprung on our farm, new livestock additions have seen my own manure heap grow in size. I am not an American farmer facing a millions of tons of waste, but a problem is a problem, which means trying to find solutions. Interestingly, I’ve discovered a number of different options, some of which put biodegradable waste in a new light. I offer the information to nature and land lovers alike, since perspective is the first step to understanding, and to change. The most obvious use for bio-waste is as fertilizer. Spreading it around adds countless nutrients to the soil. But don’t overdo it. Heavy rainfall is always a risk, since one downpour can wash the waste into nearby rivers where it will do more harm than good. Fertilizing soil is a labor-intensive effort, so keep it simple. Let your wandering animals do most of the spreading work for you. A second option is using waste as building material, a process that goes back 6,000 years. 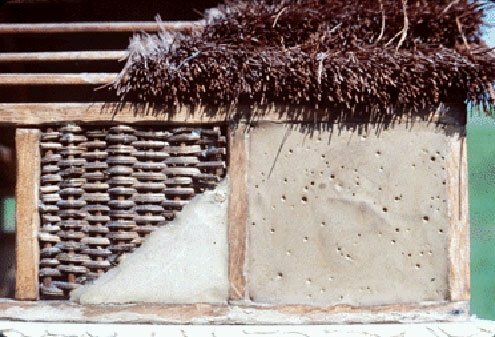 People all over the world still mix straw with clay and dung to create wattle and daub, a composite material that helped build basic homes for centuries (beginning in the Neolithic period). Wattle and daub is simple but effective amalgam you can also use to build or bulk up smaller structures. It has no downside, except perhaps the execution, which probably isn’t everybody’s cup of tea. There are also limits to the kinds structures you can build — but who needs a skyscraper on a farm? Third, you can transform waste into methane gas. This involves fermenting the dung anaerobically (without oxygen) and collecting the trapped gas. Cattle manure is particularly rich in methane. While the idea has its worthwhile side (after the initial investment to get the necessary technology), it also means maintaining a large open tank of waste to feed the system, which means an awful lot of very smelly slurry to disperse with at the end. My last solution is my favorite by far. It’s among the solutions Mother Nature comes up with on her own, as in bees pollinating fruit trees and spiders eating flies. Worms will turn poo into completely benign, neutral, odorless and nutrient-filled soil. What’s more, they’ll enjoy doing it. The only flaw is that while the worms will gladly eat their own body mass worth of waste daily, you need an awful lot of them going at once to make an impact. But once you have your worm army, it’ll keep working for 15 years or more, so as long as you feed it. The worms will also provide food for all kinds of birds and small animals. That’s why I’m spending my days sifting through manure and harvesting both worms and cocoons. I then “kidnap” them into my laundry room for rapid reproduction. Wonder Worms UK, a giant worm farm in West Yorkshire, has been in business for decades. The owners would probably be delighted if a mega dairy were to open up nearby so that they wouldn’t have to travel around for worm food. I don’t know if any of these options can immediately assist larger farmers, but you have to start somewhere, and remember that nature itself can provide simple answers to big problems. We just need to be a bit more symbiotic. Lucy Brignall's "The Farm" column appeared between 2012 and 2016.